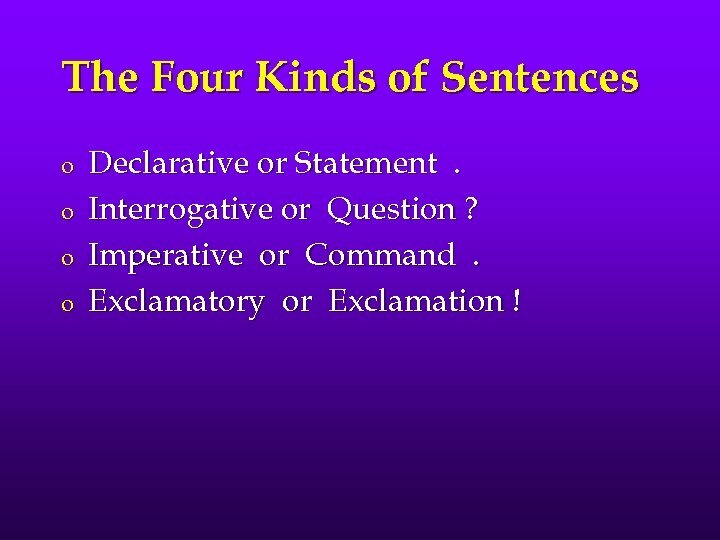 The Four Kinds of Sentences o o Declarative or Statement. Interrogative or Question ? Imperative or Command. Exclamatory or Exclamation ! 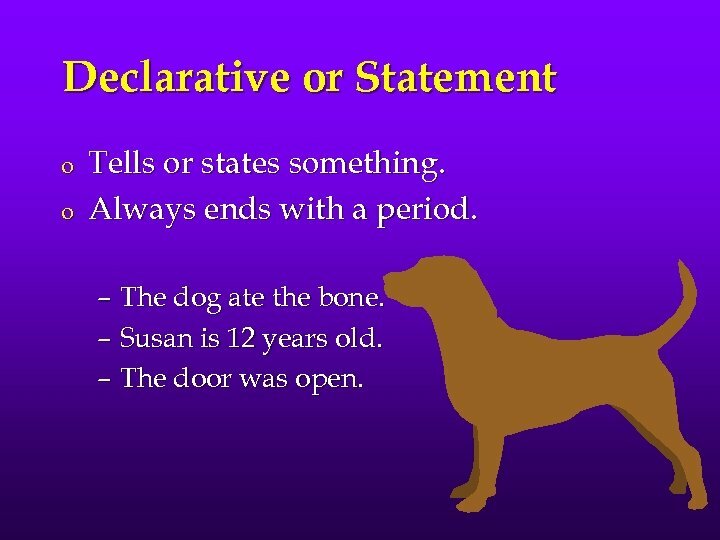 Declarative or Statement o o Tells or states something. Always ends with a period. – The dog ate the bone. – Susan is 12 years old. – The door was open. 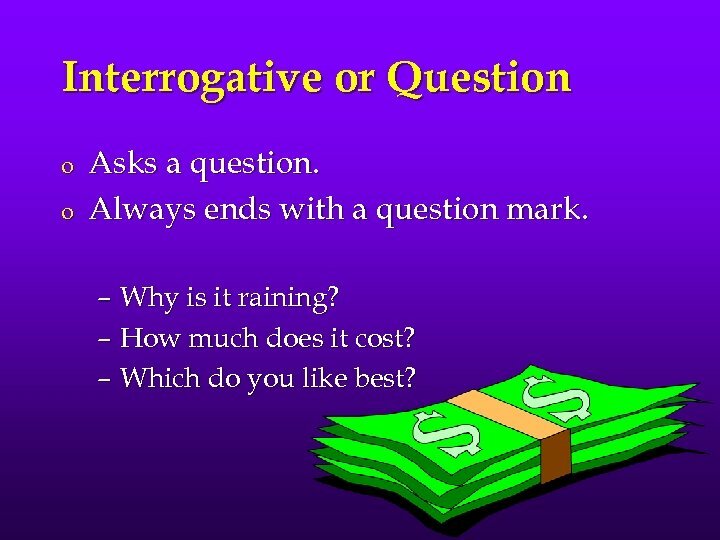 Interrogative or Question o o Asks a question. Always ends with a question mark. – Why is it raining? – How much does it cost? – Which do you like best? 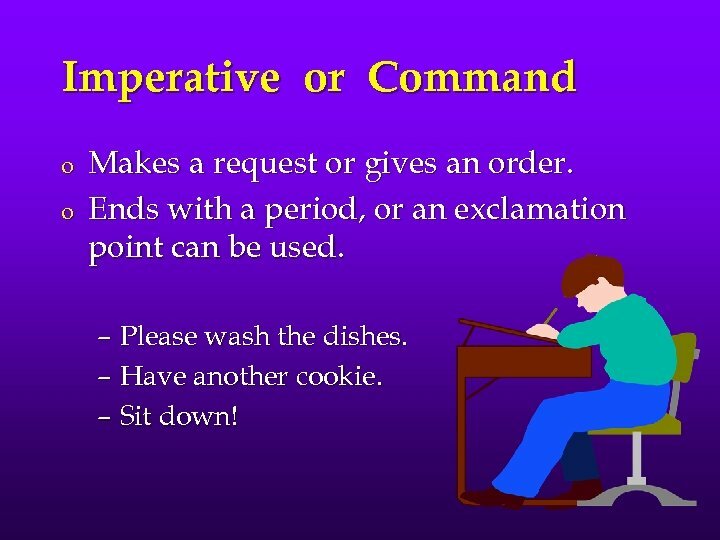 Imperative or Command o o Makes a request or gives an order. Ends with a period, or an exclamation point can be used. – Please wash the dishes. – Have another cookie. – Sit down! 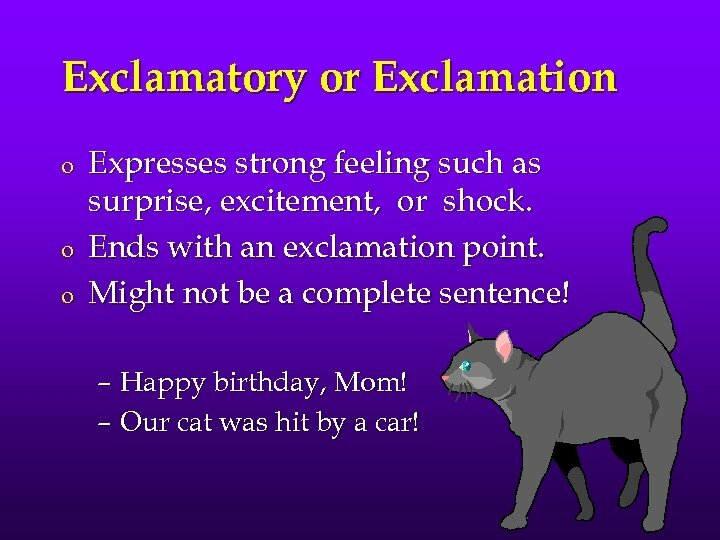 Exclamatory or Exclamation o o o Expresses strong feeling such as surprise, excitement, or shock. Ends with an exclamation point. Might not be a complete sentence! – Happy birthday, Mom! – Our cat was hit by a car! 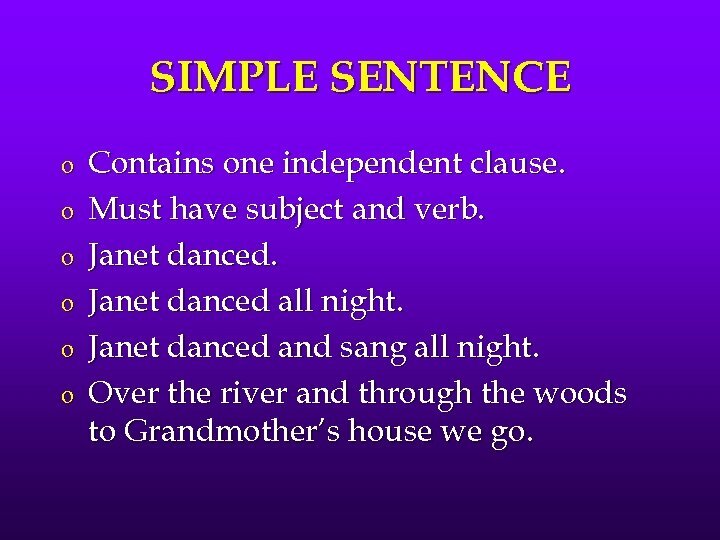 SIMPLE SENTENCE o o o Contains one independent clause. Must have subject and verb. Janet danced all night. Janet danced and sang all night. Over the river and through the woods to Grandmother’s house we go. 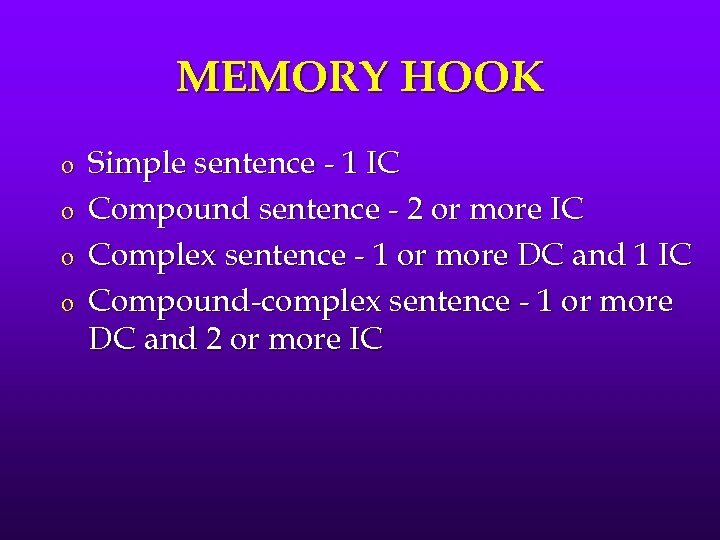 COMPOUND SENTENCE o o Contains two or more independent clauses. Janet danced and Phil danced. Janet danced at her station, and Phil danced in the room. 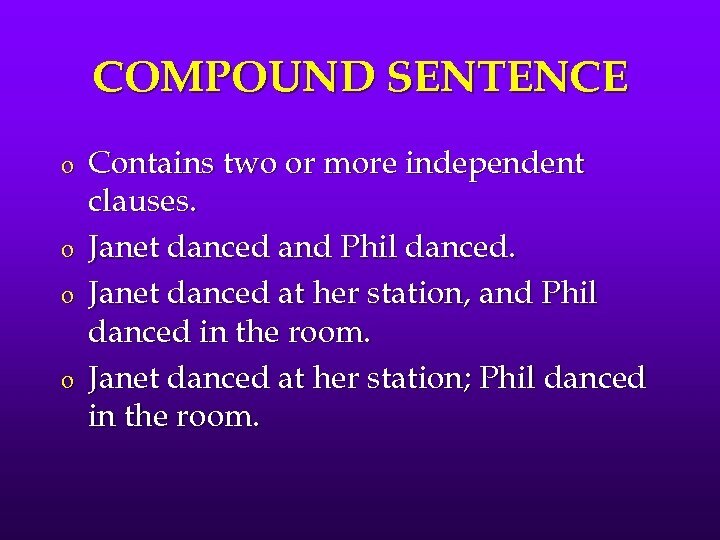 Janet danced at her station; Phil danced in the room. 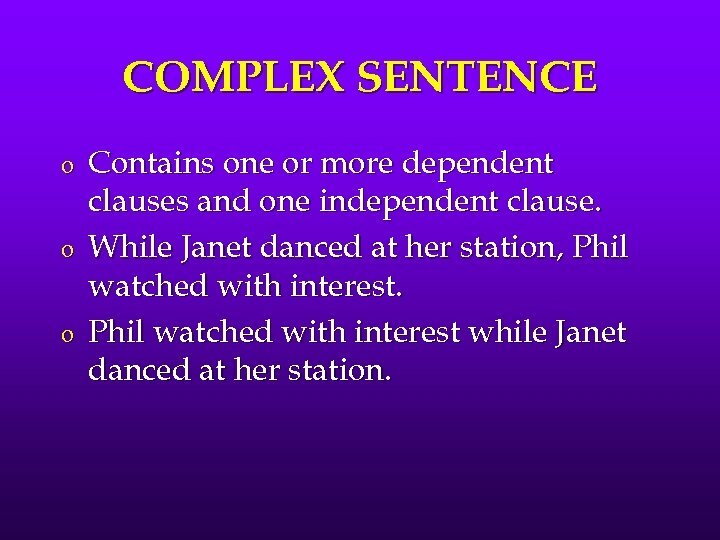 COMPLEX SENTENCE o o o Contains one or more dependent clauses and one independent clause. While Janet danced at her station, Phil watched with interest while Janet danced at her station. 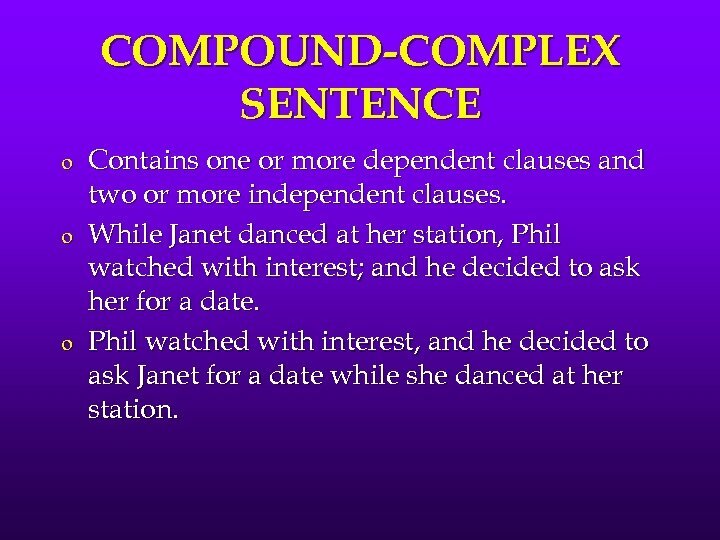 COMPOUND-COMPLEX SENTENCE o o o Contains one or more dependent clauses and two or more independent clauses. While Janet danced at her station, Phil watched with interest; and he decided to ask her for a date. Phil watched with interest, and he decided to ask Janet for a date while she danced at her station.